You can see it for yourself over on the Editing Hart blog, run by Shen Hart and Michael Keenan. I’ve said this a lot in the last couple of weeks, and I’m saying it again. I’ve learned more about my craft and English in general after my formal education (I graduated from college in 1979) than I ever did during it. While I was in school studying to become a teacher (which I actually did do, for a year), I believed that we had Rules and only Rules, no guidelines. Rules were made to be Followed, and if one did not Follow the Rules, one would be in Serious Trouble. Anyway, before this turns into a wholly different type of post than I intend it to be, here are three books I bought this month and really should have bought long ago. See links in the post to get your own copies! The Business of Editing by Richard H. Adin is a rather heavy read for me, but not unreadable by any stretch. I’ve skimmed the entire book and am now taking my time, forcing myself not to read only the chapters with interesting titles (like “The Elusive Editorial Higgs Boson”). By the time I’m done I’ll have gotten some validation, some thwacks on the knuckles, and a good deal of excellent advice. As with Carol Fisher Saller’s The Subversive Copy Editor, I’m finding that I’m already on the same page in many areas as the esteemed author. How I managed to do that with no formal training as an editor — only OTJ for me! — I have no idea. But I think as they do, when it comes to interacting with clients. That’s a big HOORAY for me. Marketing Your Editing & Proofreading Business: Being interesting and discoverable by Louise Harnby is a handy little text, too. Most of us editorial types see “marketing” and freeze. That is NOT what we do. We’re not marketing people. But we must be. No one’s going to market for us, not even our happiest clients. Word of mouth goes only so far. Harnby’s book is filled with ideas to take and make one’s own, from cold-calling (UGH) to social media posting (YAY). Again, I’m glad to see that I’m getting some of it right all on my own. I can do more, though, and I will. The third book, on the bottom in the photo, is (sorry, Mr. Adin and Ms. Harnby) the most invaluable of the three in my professional (I can say that!) opinion. 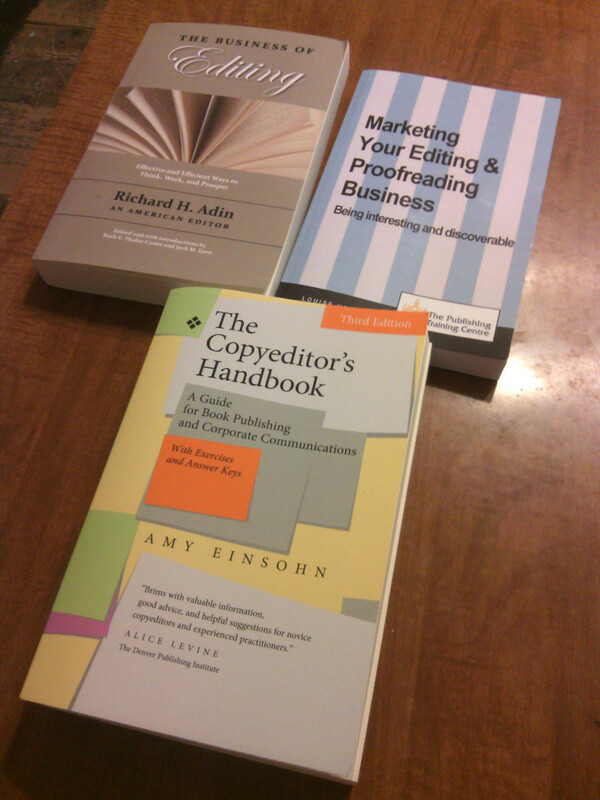 Amy Einsohn’s The Copyeditor’s Handbook: A Guide for Book Publishing and Corporate Communications is proving just as useful to me, with my 20+ years of experience, as it would to someone just starting out. It is not a style guide. It’s a thorough discussion of the rules of copyediting. Quoting the back cover: “[This book] is a lively, practical manual for newcomers to publishing and for experienced editors who want to fine-tune their skills or broaden their understanding of the craft.” There’s nothing for me to add, really. So far I have worked through three of the exercises (yes, it’s a workbook! With an answer key!) and scored 100% on each. Each of these books is available from Amazon.com. Even with the “we’re sorry, we’re not able to ship these together” emails, I still had all three texts within a week of ordering, and they came a day apart in two shipments. I can’t complain.